Keep Britain Tidy is seeking new #LitterHeroes Ambassadors to join their volunteer programme. During your work you may meet members of the public who want to volunteer and have a real passion for community engagement and keeping public spaces clean. 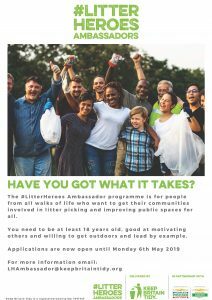 Keep Britain Tidy would love you to encourage them to apply to join their enthusiastic #LitterHeroes Ambassadors in becoming community activators across the UK. Please click here for poster to display in your community hub. You can apply online or email LHAmbassador@keepbritaintidy.org for a link to the application form. For more information, please visit their website. Applications close on Monday 6 May 2019. 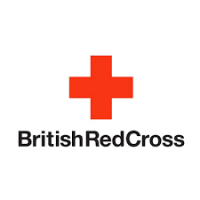 The British Red Cross is working with local community groups, charities, retirement homes etc, to deliver some basic first aid skills relevant to the participants. The sessions are free and are delivered at your venue. Generally they are approximately two hours but this can be altered to suit. The sessions are informal and interactive allowing participants to freely ask questions and giving them the information which is relevant. Topics covered are based on the needs of the group, thereby making it useful, with the aim of improving people’s confidence in an emergency situation. They can also run the sessions as a talk as some groups like to have a guest speaker at coffee mornings/evenings etc. Hundreds of charities, social enterprises and community groups across the country are working to alleviate loneliness and help people feel more connected to each other. But what’s the best way to know if their activities are working? The What Works Centre for Wellbeing has released free ‘A Brief Guide to Measuring Loneliness’, a 12 page guide, funded by the National Lottery Community Fund, that includes recommended questions for children and adults, plus an editable questionnaire template, to help organisations assess the effectiveness of their work. The guide is aimed at anyone wanting to understand the impact of their charity on loneliness, especially people with responsibility for monitoring and evaluation. It takes a realistic approach to evaluation to avoid overloading charities and the people they support with too many questions. It acknowledges the strengths of small organisations in collecting evidence about people’s personal journeys, and gives advice on how to have conversations about a sometimes difficult and sensitive topic. They also acknowledge that those projects that are trying to alleviate loneliness are also aiming to improve the overall wellbeing of people they work with and offer an online guide for measuring wellbeing impact, which can be used alongside this guidance on loneliness to understand the full effect your activities are having on people’s lives. Read more and download the guide here. Proactively work towards building better community cohesion and trust, and encouraging respect and understanding in the local area. Proactively promote the inclusion of marginalised groups and individuals in the life of the local community. Fund work which breaks down barriers and tensions in the local community thereby reducing feelings of division and “them and us”. The Foundation is seeking applications from community-led grassroots groups and organisations that have a focus of work being at a very local/community level; this could be a housing estate or distinct community. Applications will be particularly encouraged from areas of high deprivation – but not exclusively – and the Foundation is keen to support communities in coming up with their own solutions to local issues of division. New initiatives and those that may have been tried before or are on-going are considered as long as the work has lasting benefits for those people the projects are aimed at. In 2018, of the 153 grants awarded 112 were single grants with the remainder being for two or three years. The majority ranged from £750 to £15,000. The Screwfix Foundation works with both national and local charities, donating much needed funds to help all sorts of projects – from repairing buildings and improving facilities in deprived areas, to decorating the homes of people living with sickness and disabilities. The Foundation supports projects with grants of up to £5,000 that will fix, repair, maintain and improve properties and community facilities for those in need by reason of financial hardship, sickness, disability, distress or other disadvantage in the UK. Read more and apply here (the link to the Foundation can be found at the bottom right hand corner of the main page). BlueSpark provides funding for projects that aim to improve the education and development of children and young people by means of educational, cultural, sporting or other activities. Particular consideration is given to projects that they believe will help enhance the self-confidence, team working skills and future employability of children and young people. BlueSpark provides funds for relatively small-scale projects which might not happen at all or would only happen on a smaller scale without their support. Funding provided by BlueSpark for any particular project must constitute a significant proportion of the costs of that project rather than being marginally incremental to its funding. If an organisation is able to raise part of the cost of a project itself, that will be a favourable factor in the assessment of a grant application, particularly where the application is for more than £2,000. 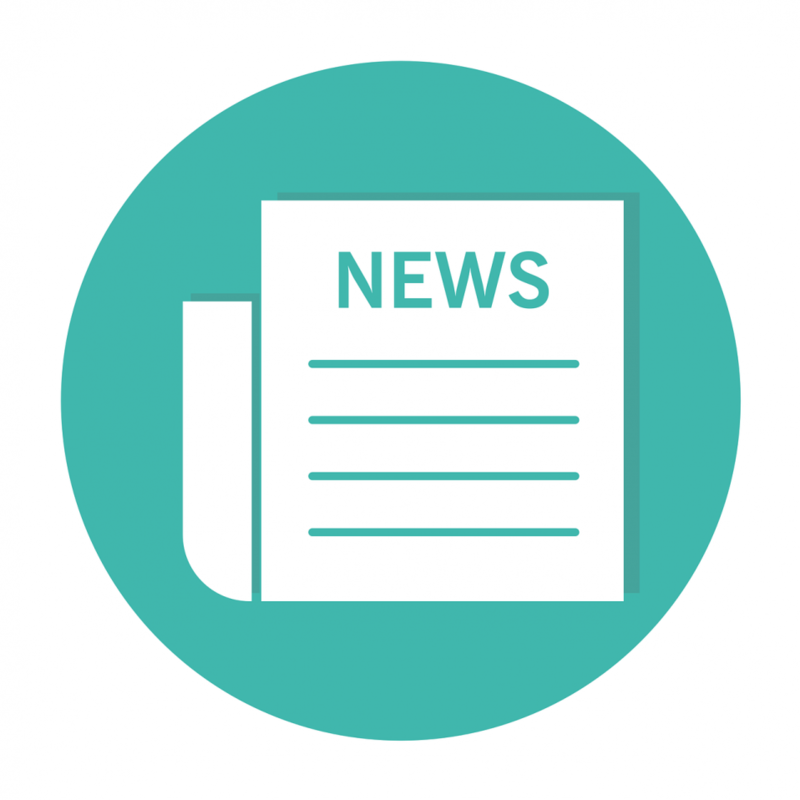 The Thomas Wall Trust considers applications for grants of up to £1,000 for small charities running specific projects or activities. Projects must aim to serve the educational and social needs of the community. Thank you for your booking: Thomas Wall Trust (Grant – UK). We will be in touch soon to confirm your place.